The team has discovered a control chair in Atlantis. It has not been powered up yet, and it is still unknown what systems it can control. The Atlantis expedition has established an Alpha Site on another planet — but it has been discovered and attacked by the Wraith. There is now nowhere to evacuate to when the enemy armada arrives. The ability to sense the Wraith among some Athosians is stronger in some than in others. (Teyla’s sense has always been among the stronger.) There have been a few who have this ability born in each generation. Teyla’s sense that the Wraith are nearby has been constant for some time now. It may be because she knows they are on a direct course for Atlantis (first learned in “The Brotherhood”) — but this seems unlikely. She knows enough to distinguish her extra-sensory perception from a psychological phenomenon, yet the three coming hive ships are still several days away. There was once a planet on which those who were taken in Wraith cullings were returned on several occasions. Some believed the taken had been blessed with a gift that made them unwanted to the Wraith, or that they had somehow vanquished the Wraith. These “taken” soon became feared (they began hearing voices, acting violent, and even committing murders) and were ostracized and sent away. They were, in fact, lab rats who had been taken by a Wraith scientist for study and returned in the hope that several generations of breeding with normal humans would dilute their new-found abilities. The Wraith later learned of the scientist’s actions and wiped out the every inhabitant on the planet — but not before some of the ostracized apparently traveled to Athosia and passed on their altered genes. The door to the Wraith research facility was likely keyed to Wraith DNA — must as the Ancients keyed some of their technology to Ancient DNA. Only Teyla, with her Wraith DNA, was able to access the door. The Wraith language is a derivative of Ancient. The creatures not only evolved as a result of the Ancients’ efforts to seed the galaxy with human life, but they (like the human worlds populated by the Ancients) also took the Ancients as in some measure a basis for their culture. Those who can sense the Wraith, like Teyla, can do so because their ancestors were genetically engineered with Wraith DNA. A single Wraith scientist, working in secret against the wishes of his species, studied humans taken in cullings with the intention of trying to make their food more compatible with them, to make the feeding process more efficient. He introduced Wraith DNA into their genetic structure, which had unforeseen results. The scientist discovered that his subjects were developing Wraith mental abilities; they were able to hear the Wraith’s telepathic communications with one another. He stopped his experiments and returned the subjects to their home, hoping that several generations of reproducing with normal humans would dilute the ability enough for him to continue his research without such a significant risk to his species. The Wraith constantly communicate with one another over vast distances by a telepathic network. Its limits are unknown, but it appears to extend many light-years across the vast distances between stars, as Teyla was able to tap into it even with the Wraith ships several days away. It also means that she should be able to read specific Wraith minds up-close, though Teyla would require some training and practice. Though they can project images and compel action with their mental powers (“Rising, Part 2”), the Wraith, however, cannot read human thoughts. 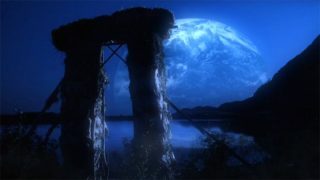 That Teyla possesses Wraith DNA and can be taken over by them remotely can only fuel Sergeant Bates’s concerns about her presence in Atlantis, as Lieutenant Ford observed. As the city’s appointed security chief, Bates has had his eye on Teyla since she arrived (“Suspicion”). He already suspects that it was Teyla who gave away the location of the Alpha Site when she was telepathically connected to the Wraith (and he’s probably right) — but he also suspects that she may be compromising their security deliberately. The Wraith evolved after the Ancients’ arrival in the Pegasus Galaxy several million years ago. In fact, they evolved as a result of the Ancients’ efforts to seed the Pegasus Galaxy with human-form life. The planet where the life-sucking bugs are native (“Thirty Eight Minutes”) was apparently one of the planets seeded by the Ancients, and the creatures took on human DNA at some point in their evolution. The bug-human hybrid Wraith evolved there instead of normal humans. The Wraith must be able to feed on forms of life other than humans, if they never encountered full-blooded human beings until they learned to use the Stargate to travel to other worlds. Certainly there are other forms of life on their homeworld that the bugs feed on, which would naturally be able to sustain the Wraith as well. The Wraith must have evolved very rapidly, intellectually and technologically, in order to become a power that matched the Ancients. There were millions of years over which this could have taken place, but it was no doubt aided by the Wraith’s longevity. The Wraith appear to “tag” certain planets, though for what purpose is unknown. Sergeant Bates reported that they dropped some sort of device by the gate on the Alpha Site; Sheppard said that it is something he has seen before. He may suspect that it was the same thing as the beam of light he recently saw on a world being culled (“Letters From Pegasus”). Teyla believes that the Wraith want something more than to feed on the inhabitants of Atlantis. They are confident that they can take the city, especially because of their superior numbers. But there is an urgency about their plans: they have all awakened early and there is not enough food for them all. They are primarily concerned with finding the way to Earth, having learned from Colonel Sumner that this one planet has more humans for them to feed on than all their feeding grounds in the Pegasus Galaxy (“Rising, Part 2”). There is now less than one week before the Wraith arrive. The Atlantis expedition includes about 200 people, most of whom are scientists. Teyla Emmagan – Teyla made the major discovery that she has some Wraith DNA — she shares some biology in common with her feared and hated enemy! She has sensed that the Wraith are nearby for some time now, and the constant feeling has been giving her horrible nightmares. Teyla also discovered that her DNA (passed down from victims of Wraith experimentation) gives her another rare ability: she can connect to the Wraith telepathic communications network. This gives her the ability to gain valuable intel, but it comes with the high risk that she could be taken over by the Wraith when she attempts it. Rodney McKay – McKay is ambiguous about whether he is “seeing” Dr. Heightmeyer on a romantic or a professional basis. He implies the former to Teyla, but he may have just been covering. Why has Teyla been sensing the Wraith for so long if they are so many lightyears away? Can the Wraith connect with Teyla at will? Will Teyla be able to develop better control over her new-found telepathic ability? Will she be able to read the mind of a specific encountered on a mission? Did the altered humans who left their home encounter and procreate with anyone other than the Athosians? Are there other human cultures out there with their descendants? What happened to the Wraith scientist who was giving humans Wraith DNA? Is he still alive? Does he know that some of those who have inherited the Wraith genes are still alive on other worlds, and does he still intend to find them and resume his project? Will the Atlantis expedition stay and defend the city? Can they find a new Alpha Site to evacuate to? VOTE! How would you rate Atlantis's "The Gift?"